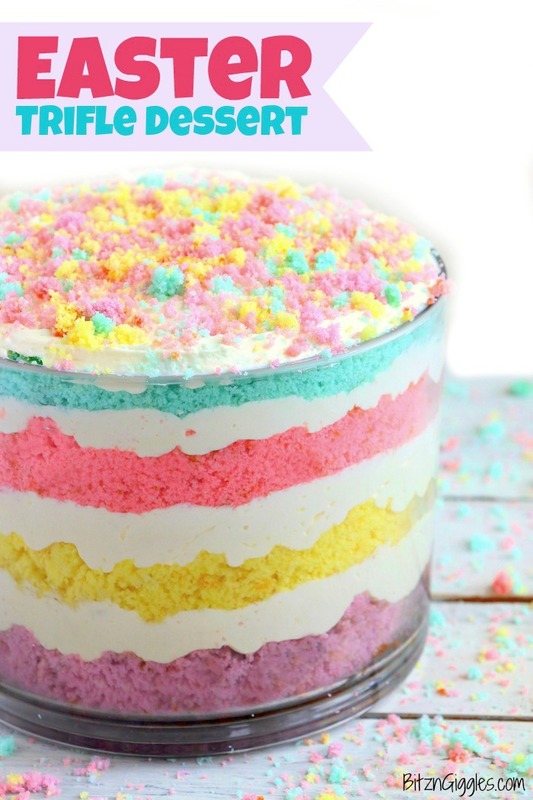 Easter Dessert Trifle – An easy and colorful spring trifle dessert made with white cake and a sweet creamy filling! Easter is just a few days away and I’m looking forward to celebrating the weekend with family. Most years I’m asked to bring dessert to the family Easter meals. I say, “meals” because we celebrate with my in-laws on Saturday and my family on Sunday. We’re so blessed to be able to spend time with our entire family, and we always look forward to weekends like this. 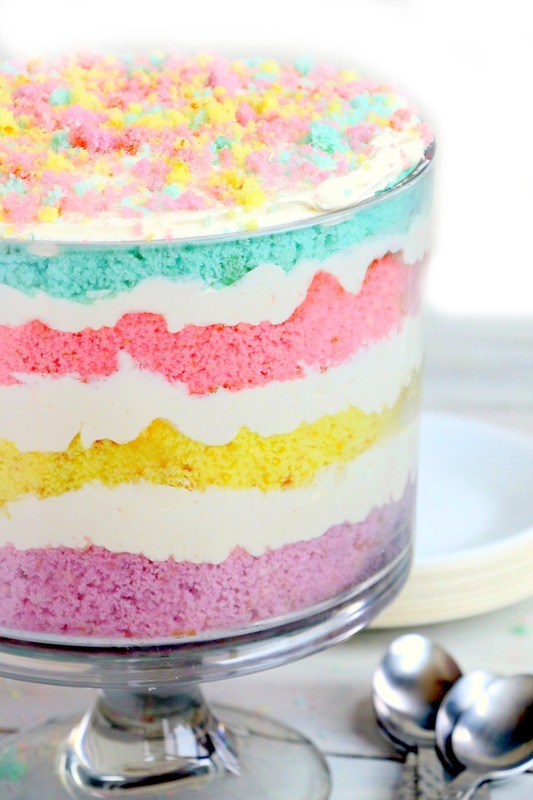 Today, I’m sharing a fun and colorful Easter Trifle Dessert with layers of white cake and sweet, creamy filling. This trifle dessert is guaranteed to get lots of oohs and ahhs, and it’s something the entire family is sure to love! 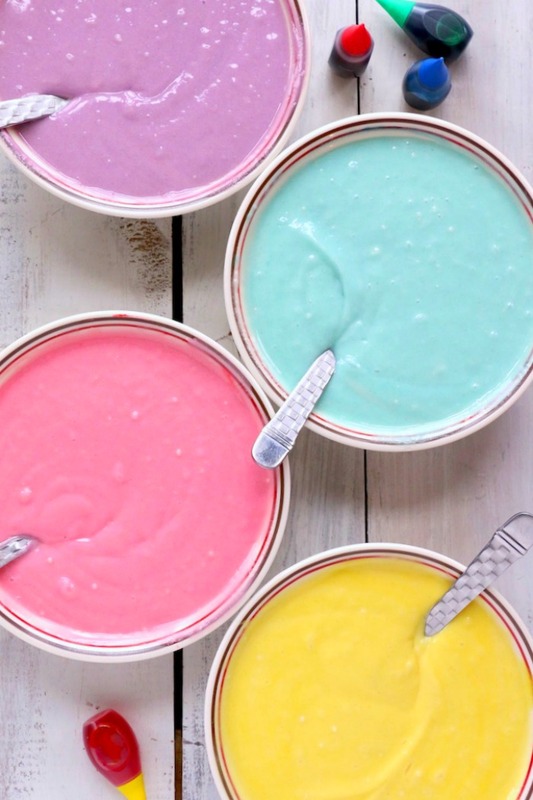 Start by dividing the cake mix batter into separate bowls and creating the four colors. Each bowl of batter should get transferred to an 8″ round cake pan to be baked. After the cakes are baked and cooled, you can start whipping together the cream. The cream used between the layers of cake is more substantial than just whipped topping alone. The addition of cream cheese and sweetened condensed milk provide a more creamy texture and even more flavor. After you crumble up the individual cakes, you can start the layering process. It’s up to you how you would like to layer the colors. I started with purple on the bottom, then added yellow, then pink and ended with blue at the top. Once I added the final layer of cream to the top of the trifle, I used the cake crumbles I had reserved to sprinkle over the top of the trifle. Now, how pretty is that? I love the bright colors. Perfect for spring or an Easter celebration. Your friends and family will want to dig right in. 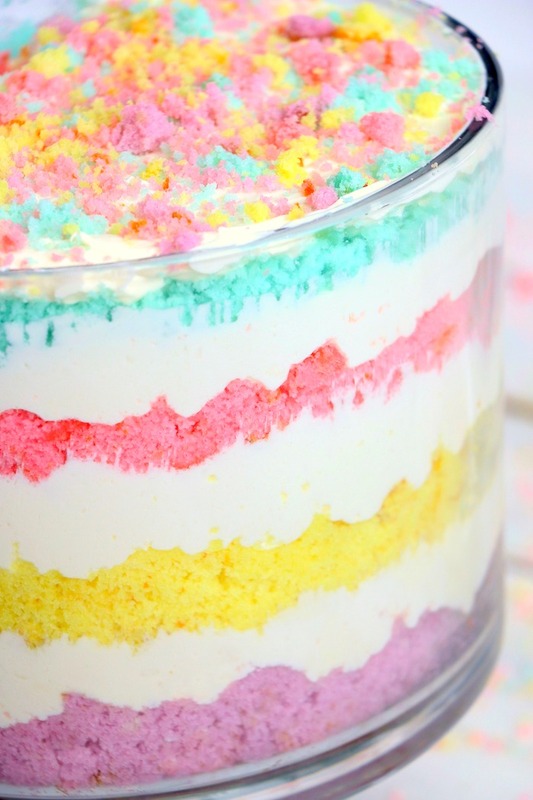 An easy and colorful spring trifle dessert made with white cake and a sweet creamy filling! Prepare the cake mixes according to the box directions. Split batter evenly into 4 bowls. In the first bowl (to create the purple layer) add 6 red drops and 5 blue drops. In the second bowl (to create the yellow layer) add 5 yellow drops. In the third bowl (to create the pink layer) add 6 drops of red food coloring and 1 drop of blue. In the fourth bowl (to create the blue layer) add 4 blue drops and 2 green drops. Bake each layer in an 8” round cake pan for 23-25 minutes. Allow cakes to cool. Set aside. 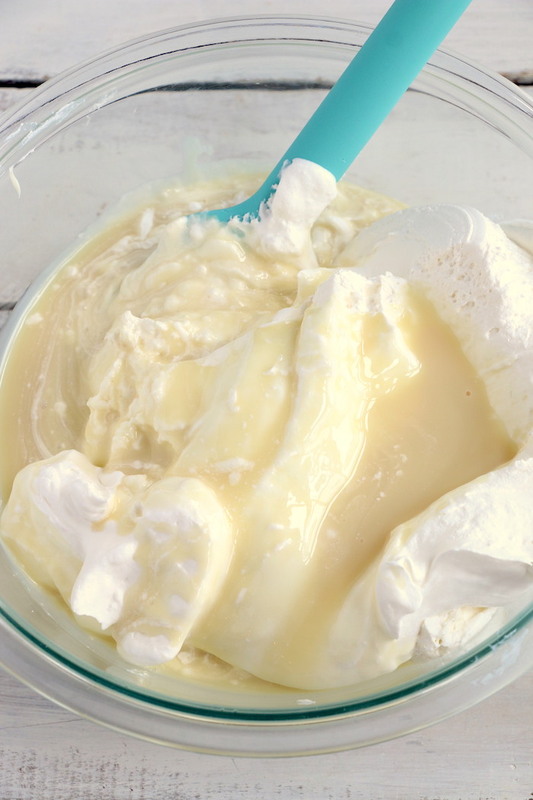 In a medium bowl, mix whipped cream cheese, sweetened condensed milk and Cool Whip until well combined. Crumble each cake, setting aside a 1/4 cup of each color for topping. 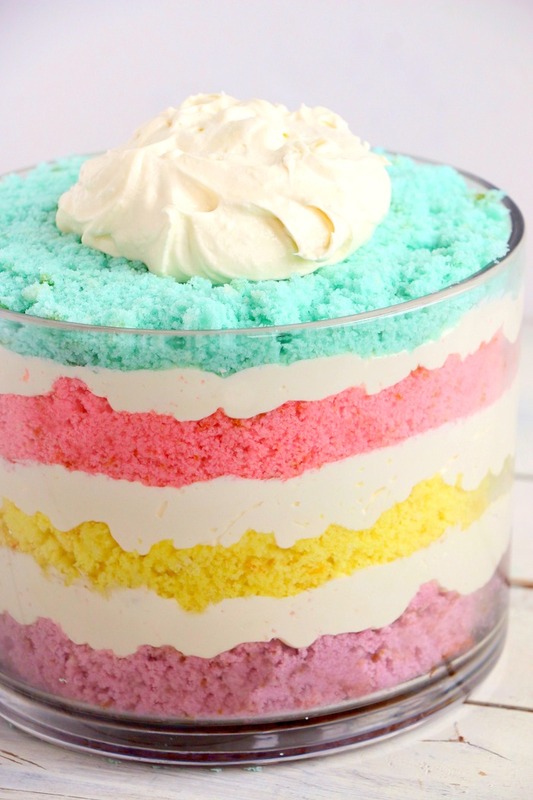 To assemble trifle, alternate each color of cake with a layer of cream. It’s up to you how you would like to layer the colors, but I chose, purple, yellow, pink and blue at the top. 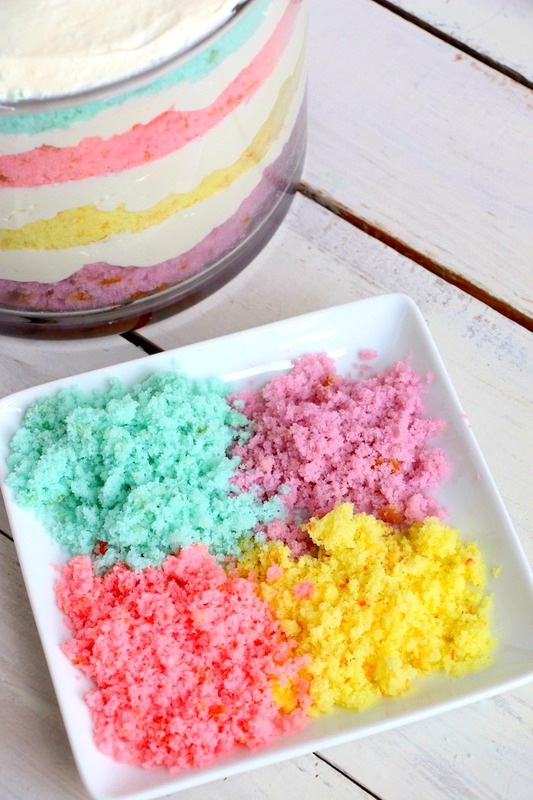 To finish, sprinkle remaining cake crumbs on top.